I’d be absolutely lost with my electric sander. To be quite honest, even after all of my years of DIYing, I’m still a bit fearful of saws, but I love my sander. They’re easy to use once you get the hang of it. They’re relatively very safe, compared to saws. The worst you might get from an electric sander is some roughed up skin if you accidentally touch the sandpaper while it’s still spinning, and while that can definitely be startling and painful, the chances of you actually getting a serious injury (or losing a finger!) with an electric sander are slim to none. These are quite safe for adults to use. 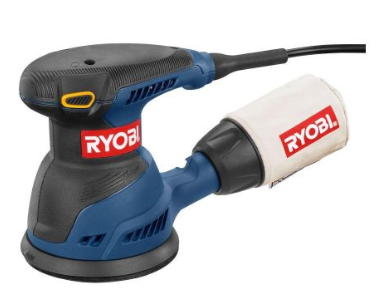 The sander that I own is a Ryobi 5″ Random Orbit Sander (pictured to the right). It cost me about $40 from Home Depot. When shopping for an electric sander, it’s important to understand the differences between the options available. For sanding large areas, you really have two options: orbital sanders and finishing sanders. Orbital Sanders are by far my favorite kind of electric sander. (Again, that is what’s pictured above.) 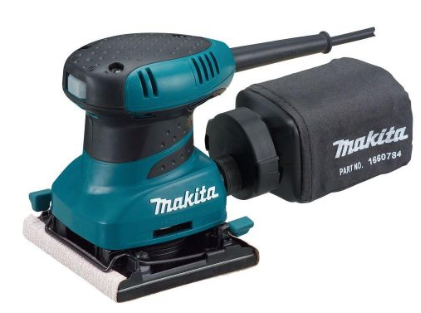 The sanding pad on an orbital sander is round, and when the sander is turned on, the sanding pad moves back and forth slightly while also spinning in circles. Changing the sandpaper on an orbital sander is so incredibly easy of you’ve purchased the type that uses hook and loop sanding discs. The one downside to an orbital sander is that it requires a special sandpaper (the discs with the hook and loop backing), which is considerably more expensive compared to regular sandpaper sheets. Right now, a package of 10 sandpaper discs costs around $9.50. Finishing Sanders, also called Sheet Sanders, have a square sanding pad, and they sand in one back-and-forth direction. There’s really no major price difference between a finishing sander and an orbital sander. The price will be largely determined by the brand you choose. The good thing about finishing sanders is that they use regular ‘ole sandpaper sheets, so you don’t have to spend more money for specialized sandpaper. You simply take one sheet of sandpaper, cut it into four equal sections, and one of those sections fits perfectly onto the finishing sander. That means that the cost of using a finishing sander will be quite a bit less than the cost of using an orbital sander. The downside is that changing the paper out takes much longer. With the orbital sander, you simply pull off the old sandpaper disc, and stick a new one on (think: Velcro). It takes about five second. With a finishing sander, you have to first cut a sheet of sandpaper into fourths. Then you place the sandpaper into a groove, wrap it around the bottom, and insert it into the groove on the other side. Some older models utilize clips that are (in my opinion) a real headache. Is my bias showing? 🙂 And honestly, my experience has been that these don’t sand as quickly, but I’d love to hear if you’ve had a different experience. Detail Sanders are usually small little electric sanders that come with several attachments for specific purposes, like sanding spindles, or sanding corners, etc. These usually start at about $30 for a basic sander, and can cost well over $100 for a kit with lots of different attachments. 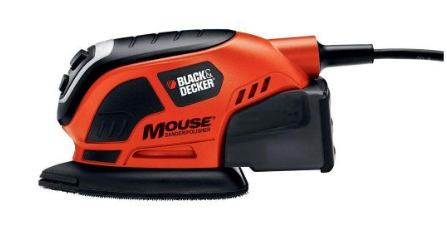 I bought a Black & Decker Mouse sander about three years ago (which did come with three or so attachments). I’ve used it once. I was trying to sand corners on my kitchen butcherblock countertops, and it took forever to remove the old finish. It just didn’t seem powerful enough to do the job. It could be that the higher-dollar detail sanders could do a much better job, but I’ve gone this long without using a detail sander, and I’ve done just fine without it, so I probably wouldn’t spend the money on another one. The top of that dresser was solid wood, and I was so excited to take a sander to it! The wood underneath that old, orange finish was gorgeous, and the new stain really brought out the beauty of the wood. And once it was primed and painted, it looked perfect! Tip: One reason I use MDF boards on projects like that one instead of solid wood lumber is because MDF sands down so easily. When you’re not a woodworker, and you rely quite heavily on wood filler and an electric sander (like I do), it’s better to use MDF that will sand down easily. Basically, any time I’m doing a project that includes wood, I’m using my sander. I used it on my bathroom shelves and the countertop. For both of those, I used very rough cedar, and after sanding, the wood was incredibly smooth. There’s no way I could have done that manually using a piece of sandpaper. 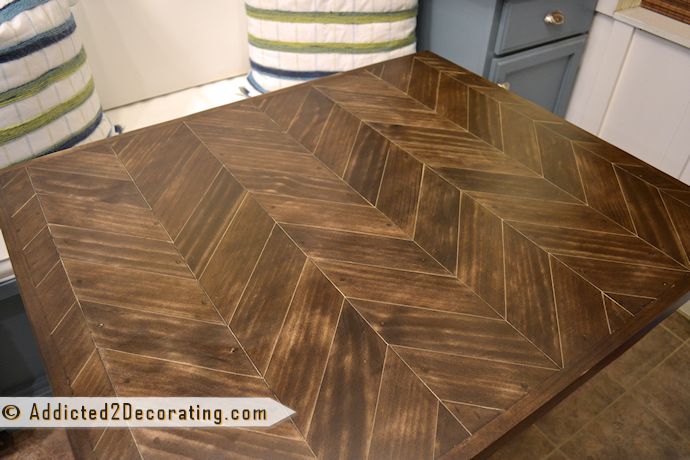 And there’s no way I could have made my chevron wood breakfast table without my sander. I piled wood filler into all of those cracks, so in addition to using it to smooth out the entire wood surface, I also needed the sander to remove all of the excess wood filler. Again, there’s no way I could have done that manually with just a piece of sandpaper. And then, of course, we can’t forget about my kitchen countertops. 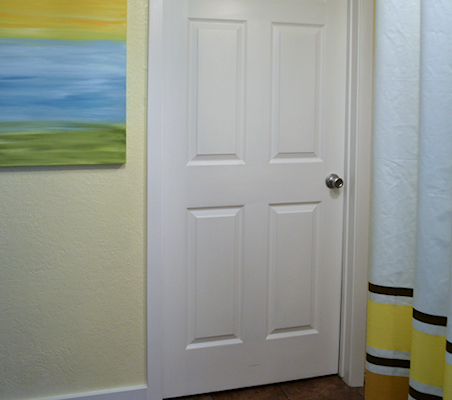 *Sigh* I’ve refinished these things three times now. There are many, many more projects that I could show you, but I think you get the idea. If it involves wood, chances are that I used my sander on it. Click here to see what my #1 recommendation is for essential power tools for DIYers! Previous Post Do Neutral Houses Really Sell Faster? Kristi, thank you for this series of posts on tools! I’m a power tool novice, and I need all the advice I can get as I tackle projects and decide what tools are worth buying for me — or not. kristi, thank you for useful detailed information. We have a finish sander that I have learned to use. It sure beats sanding by hand but I made a huge mess the first time I used it. Eventually, trial and error (the days before internet ‘how tos’) and I got it right. I agree that a sander is definately a power tool for your work area. Thanks for this series Kristi. You are so right, Kristi. 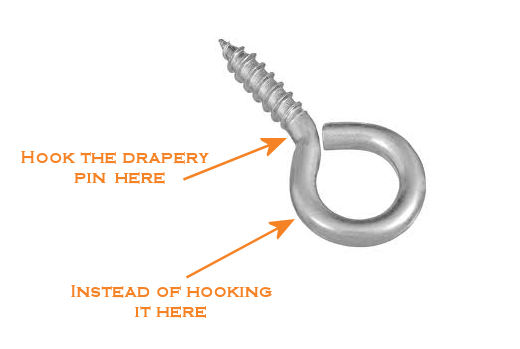 Every DIYer needs an orbital. They do the job, do it well, last a long time, and don’t cost much. Since developing R.A. and finding using tools , hand sanding , etc. to be a challenge , Sander s are such a blessing …I bought a “Mouse ” sander years ago, and it s truly paid for itself ,many time s over, in making all manner of sanding job so much easier ! Sanders , of all kinds are a tool I could not do without , and then newer one s are so much lighter,and fit the hands far more comfortably ! 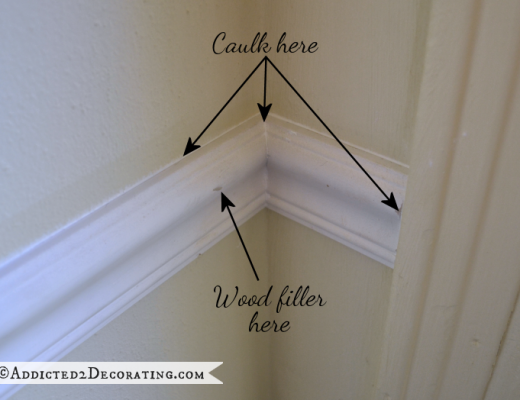 If your new to the DIYS world , I suggest a sander is a must have , and be sure to educate yourself as to the different sandpapers, they come from very course to very fine , and using the right weigh ,really does make a difference ! I couldn’t agree more. I recently picked up a Ryobi One+ Corner Cat sander (similar to the Black & Decker above,) which has worked wonders even on slightly larger projects. As an apartment dweller, I only have a small enclosed fire escape to use as a workspace, so I won’t be tackling any bigger pieces of furniture. The great thing about the Ryobi One+ series is that I can use the same batteries for both my drill, sander, and soon-to-be-purchased brad nailer. I have a brad nailer that came with my air compressor, but I’d love to be able to just pop in a battery and go for quickly adding moulding. That’s what I finally did, except I use mineral oil instead of linseed oil. 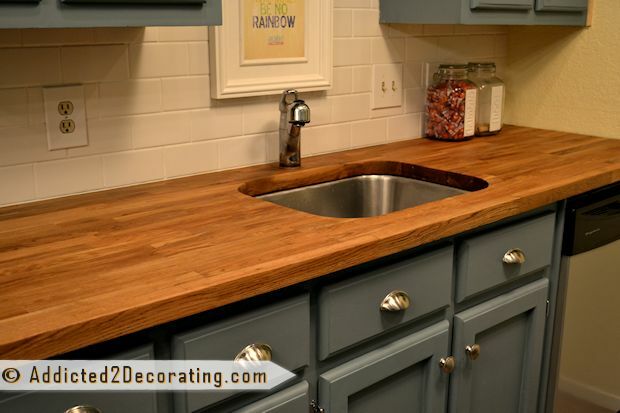 So, looking back, would you recommend wooden counter tops? I’ve always wanted them. The Ecover linseed oil has the most beautiful smell, does the mineral oil have a scent? As long as people go into it understanding that they need to be oiled regularly, I would highly recommend them! In fact, I don’t think I’ll ever have a kitchen without butcherblock countertops. I love them! They make a kitchen look so warm and inviting, and that’s a huge plus in a room that generally looks cold and hard because of all of the sleek, hard surfaces that go into it. And I love the fact that stains can easily be sanded out, and once the countertop is re-oiled, it looked just perfect. So it’s definitely been a learning lesson for me, learning what NOT to do (i.e., staining and polyurethaning kitchen countertops), but they’re still my favorite material for kitchen countertops. The mineral oil doesn’t have a scent…at least not one that I’ve noticed. 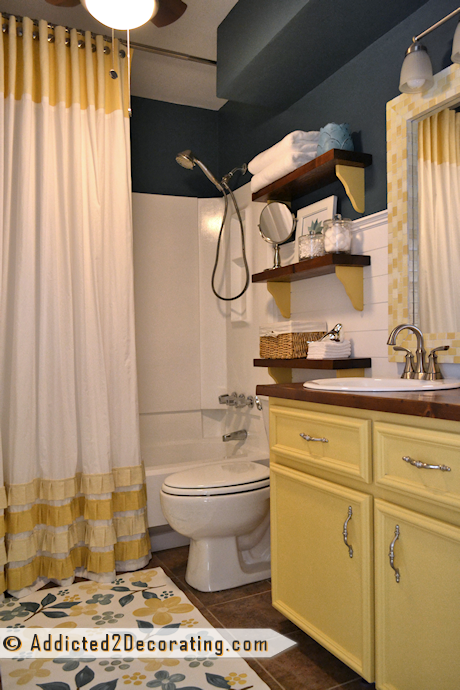 I would like to find another option for around the sink area. I have that same orbital sander and I love it! Santa brought it! Are orbital sanders any heavier than finish sanders or vise versa? I was leaning toward the finish sander you pictured because of the rec at designconfidential, but now I’m leaning toward the orbital sander because of your endorsement and the fact that I really don’t like changing the sandpaper on my super old sander that pretty much just vibrates. Thanks. When we bought our first house the floorboards were a complete mess so I hire a floor sander to clean them up. I had never seen one before let alone use on so i approached the task with some trepidation. I switched on and the beast took off as if it were possessed taking a huge chunk out of one of the floorboards. A few chunks later plus some dents in the skirting board and I had regained some control and with much swearing and lots of sweating I eventually completed the job. Surprisingly once the varnishing was done the result was quite good and I explained away the chunks to my wife as poor quality boards (I confessed 10 years later). My tip to first time users, try it out in the hire shop first! Just came back from Canadian Tire with a brand new sander because of your blog. You inspired me so much these last days I had to start doing something. Just trying to figure out what will be my first project!